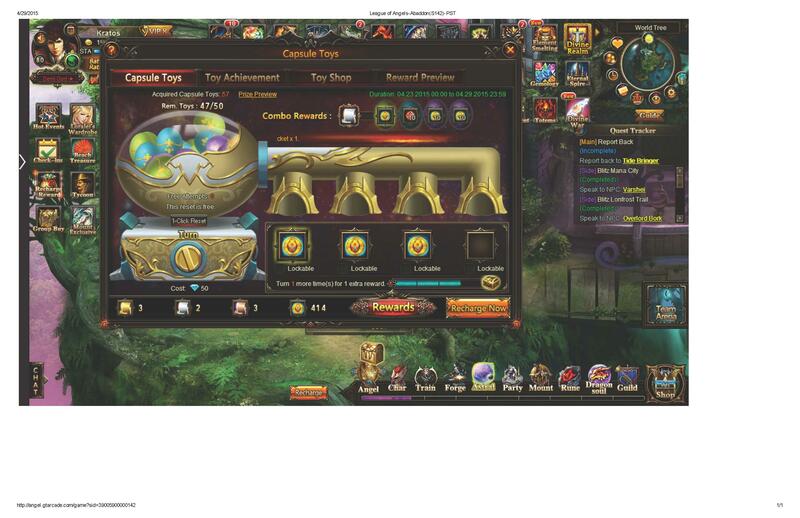 North America Forum»Forum ›League of Angels ›Support › Capsule toys Missing???!!! GTarcade, you guys did it again. Iam fking tire of this crap. The tickets from capsule toys event clearly said This item will not disappear when the event ends. I have 3 golds, 2 silvers and 3 bronzes tickets. Guess what? the event end and 3 of my gold tickets are missing. I paid alot for them. They are mine and I expect them to return to my inventory asap. You guys know what to do. And please dont fuking tell me how to look for them in my inventory. I checked line by line and column by column of every page. I dont see the gold tickets anywhere. This is bs. We players should not be subject to this shyt. Where we have to constanly worry about missing stuffs from our inventory. I\'m totally fuking tire of having to explain myself time after time. You devs make this right, resolve this to my satisfaction asap. If not Iam going to ask for a charge back of everything and quit. This game is fking messed up anyway, things broken or all bugged out. And please making me wait for a whole week or 2 is not helping with my anger. And dont even bother to said that I used them. Because Iam trying to save them up for the grand prize in capsule shop hero. So stop the blaming game on me and fix the damn game. See SS below. Your issue has been reported. I\'m sorry things don\'t move faster. tell them to look at the damn SS of my post. And dont ask me if Iam sure, look at the SS yourself. That is all I have to say. If they dont give back what is my 24 hrs, tell them to go and fuk themselve. I\'ll call my bank and start the charge back. Iam tire of this shyt broken game and all. Since most of my recharges were through paypal. I\'ll make sure to tell them that gtarcade is a fraud. 2019-4-20 05:03 GMT+8 , Processed in 0.061464 second(s), 48 queries .